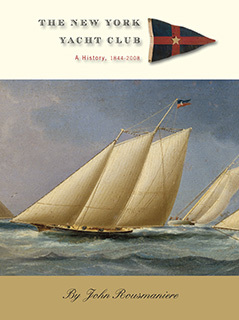 This definitive new history of America's oldest yacht club and one of the world's best known clubs covers the Club from its founding in the cabin of a small sloop in 1844 through the America's Cup years - the longest winning streak in history - before the cup was finally lost in 1983. Since then, the Club has found a whole new, dynamic life as an active, modern yacht club that still treasures its past with its superb clubhouses and fabulous art collections in New York and Newport, RI. This lavishly illustrated book will be an engaging account of yachts, races, and personalities with names like Harold Vanderbilt, J. Pierpont Morgan, Dennis Conner, Ted Turner, and today's great sailors who have shaped the Club and worldwide yachting. Author John Rousmaniere is America's preeminent yachting historian. His many books include The Golden Pastime: A New History of Yachting; The Low Black Schooner: Yacht America, 1851-1945; A Berth to Bermuda: 100 Years of the World's Classic Ocean Race; and Fastnet, Force 10.